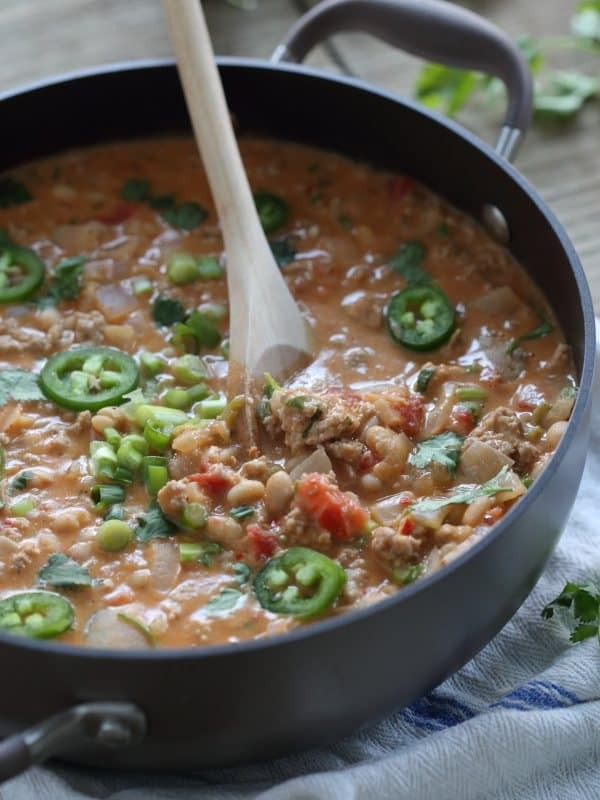 This spicy hummus turkey chili is creamy, comforting and the perfect one-pot dinner for cold winter days. After two weeks in Grenada and eating more fish in 15 days than I probably have in a year (seriously, they eat SO much fish. Even for breakfast…gag), I can’t tell you how delicious this pot of turkey chili tasted. I accomplished two things yesterday: sleeping until noon (I have no idea why since Grenada was only one hour ahead, it’s not like I was six times zones away or something but it felt amazing) and cooking this. This perfect pot of creamy, cheesy, hummus-y, turkey goodness without anything even remotely resembling fish in it. I love white chili. Maybe even more so than the usual red one because of it’s creamy factor. The one thing I’m not a fan of though is the whole roux thing usually needed to get that creaminess. So I had a thought: why not use hummus instead of a traditional roux for a way simpler, less ingredients spread out over the kitchen counter kind of alternative? 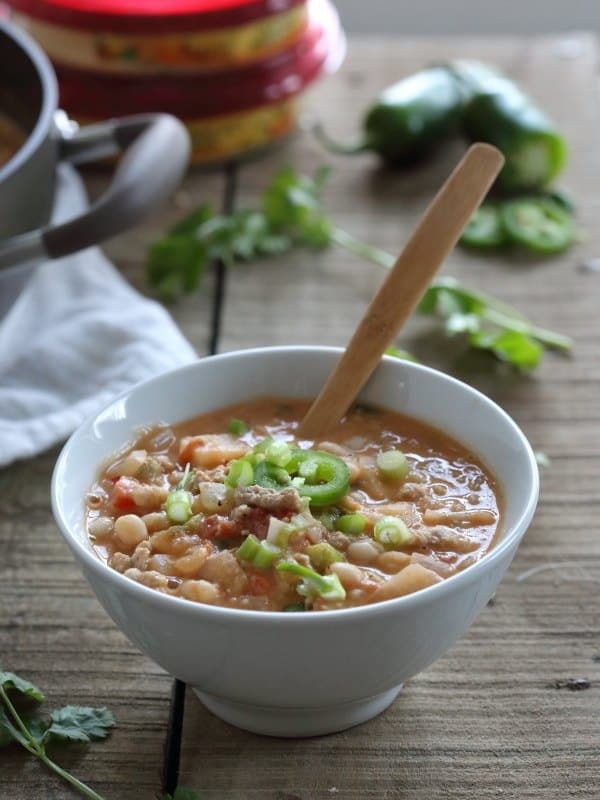 Sabra’s Supremely Spicy Hummus was the perfect addition to this spicy turkey chili. Between the jalapenos, red pepper flakes and the spicy hummus, this one packs a punch. Not overwhelmingly so, but definitely be ready for some heat with this recipe. Consider yourself warned, spice haters. You guys know how I loathe football, but I gotta say, this is pretty much the ultimate football food. Speaking of which, Sabra is hosting an Ultimate Tailgating Sweepstakes for 2 tickets to the 2016 Pro Bowl in Hawaii. You can enter HERE. Heck, even I would watch a game of football if it meant a trip to Hawaii. Heat 1 tablespoon of the olive oil in a large dutch oven over medium heat. Add the turkey and cook until browned. Transfer the turkey to a plate and set aside. Add the remaining tablespoon olive oil to the pot. Add the onion, garlic and jalapeno. Cook for about 3 minutes until softened. Transfer the turkey back to the pot and add the salt, pepper, coriander, cumin and red pepper, stir to combine and cook another minute. Add the diced tomatoes and broth to the pot, stir and let simmer over medium heat uncovered for about 20 minutes until some of the liquid has cooked off and the mixture has thickened. Add the beans, hummus and cheddar cheese and stir until incorporated and cheese has melted. Add the cilantro and green onions last and give it one final stir. I am thinking about making this for Christmas eve – one question: what size hummus container? 7oz? 12 0z? Great question, should’ve specified…a 10 ounce container. The recipe is edited to say that now. Hope you enjoy it! I just love how you used hummus here! This chili is happening soon! This is a great recie, can’t wait to try out all those wondeful flavors. 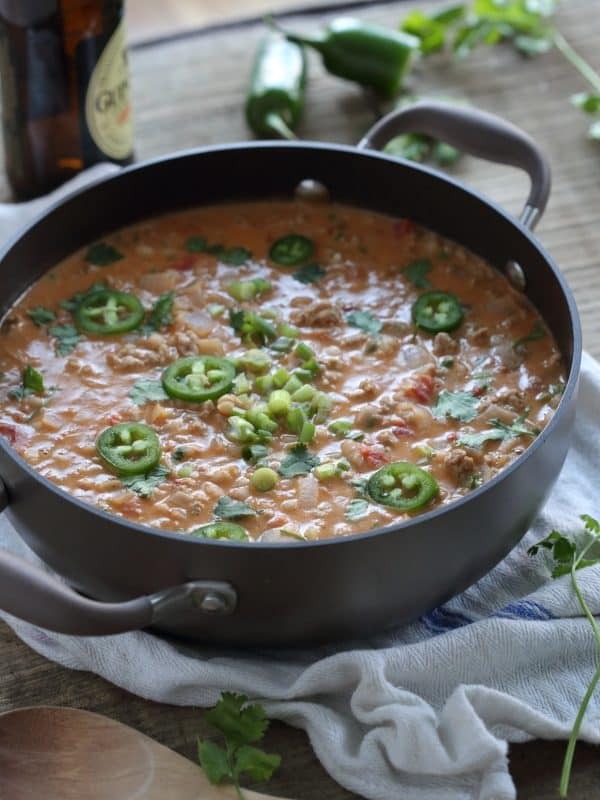 My husband will be all over those spicy jalapenos in there. Sharing and Pinning now! Now there’s a clever thought! Hummus in chili? Love it!!! This chili turned out gorgeous! Lady, this would have NEVER CROSSED MY MIND AS A THING TO DO. This is GENIUS! Fantastic idea! Hummus added to chili? I love that idea! what a genius recipe. Cozy food for cool evenings, love it! What a great idea to use hummus, so much flavor and creamy! Looks like pure comfort food for this winter! Great chili!! Love your spin with hummus!! 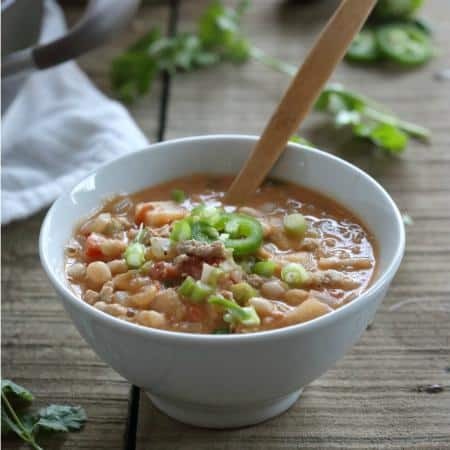 The supremely spicy hummus is one of my favorites and I love the idea of using it in chili. This recipe is so creative!! This chili was fantastic! I have cooked chili so many ways and the hummus gives it a wonderful creamed texture and taste. Loved it! Made this for my family last week during the rain. It came out lovely and was a big hit! Will definitely be putting into the dinner rotation. Thanks again for another winner! How do you think this would taste with beef? I have ground beef on hand that is why I ask. But doesn’t that not go with white beans? Or do you have a favorite beef chili recipe you could let me know about! Thanks! I think you could definitely do it with beef!